After a student moves through the subvocal speed barrier of about 800-900 words per minute, he usually hits a range of reading that can best be described as rough. Specifically, when the student's rate varies between about 900 and 1,200 words per minute, there's a tendency to shift back and forth between subvocal linear reading and visual-vertical reading. As the pace moves up toward and above 1,200 words per minute, however, the style of reading becomes more consistently visual-vertical. But it's often difficult to maintain a regular pace above the 900-word-per-minute barrier. And inevitably, when the reading rate slips below the barrier, subvocal linear reading takes over. In some ways, this problem is analogous to a challenge that may confront an airplane pilot. Pilots are instructed about the stall speed for their aircraft: If the plane's forward progress is allowed to drop below that speed, the engine may cut off. Similarly, the reading "engine" that allows you to soar at high visual-vertical speeds will shut down if you reduce your speed below the subvocal barrier. Certainly, I think it's a great achievement even to reach the point where the dominant movement of your eyes down the page is visual and where most of the information you're taking in is going directly from your eyes to your brain, without being routed through your vocal cords. But it's important for every student to know that the reading range just above the subvocal barrier, in the 900-1,200-word-per-minute zone, is a transition spot. You really must push yourself beyond the 1,200-word-per-minute range if you hope to reap all the benefits that the visual-vertical techniques can provide. So what's the next plateau, above this transition range? Most experts agree that the goal for the majority of students should be to read consistently at a rate above 1,500 words per minute. At this pace, you're able to process all the words and thoughts on the page and also to generate new thoughts and opinions of your own. You can take in the gestalt of the reading material without at the same time missing important details. In addition, you don't have to worry too much about slipping into that transition zone below 1,200, which may tug you further down, into a sub-vocal linear rate. It's important to note, as I've indicated in earlier chapters, that "reading speed" or "reading rate" refers only to the reading phase of the layered or multiple-exposure study process, not to the overview and preview that should precede the actual reading. As you already know, the overview and preview steps don't take very long; usually, about a second a page is required for those experienced at overviewing, and no more than three to four seconds a page for the preview. But these first two phases of study are absolutely essential to achieve the highest reading rates. word-per-minute range, but then something different beings to happen. In the 2,000-3,000-word range, for instance, you'll acquire a broader view of the material as you see more clearly how the sections of a book fit into each other. On the other hand, it's not as easy to pick up details in the reading. Think about it for a moment: Reading at 5,000 words per minute in a book that contains about four hundred words per page would require the student to read more than twelve pages per minute, or nearly a page every four seconds. That doesn't leave much time for fumbling with pages that get stuck together. As a matter of fact, it's really not clear whether what takes place at these high speeds should be described as traditional reading or something else. What's different about these very high speed plateaus? In the first place, studies haven't confirmed whether those who can move at this pace are seeing every word on s the page, though in many cases their comprehension scores stay high. Also, there may very well be a different mental process that comes into play at the fastest speeds. Some readers who have moved up to 5,000-10,000 words per minute or beyond have even reported near-mystical sensations. One of our managers and top instructors, David Hard-wick, began reading at a rate of 250 words per minute. Then, after taking the basic Wood course, he found that he could move along comfortably at a rate of about 2,500 words per minute with most nonfiction. 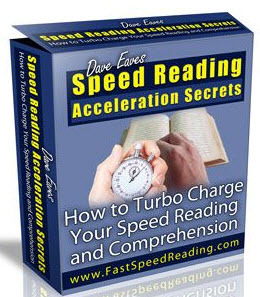 His speed with fic tion was even faster—about 4,000 to 6,000 words per minute. On the other hand, as he explains it, the entire reading process involves dynamic movement at a variety of different speeds, depending on one's objectives and the nature of the subject matter. "The only time you might lock into one speed and use it continuously is when you're in the process of taking an examination. Otherwise, you adjust your speed according to the material and your level of familiarity with it. "In other words, I may have the ability to read at 3,500 words per minute in marketing material. But you put a medical book in front of me, or a lawbook, and I'm going to have to start at a much slower pace because the language will be relatively unfamiliar." When he reaches the higher rates of speed, though, he reports that a "very definite sensation ... occurs." He notes that a reasonably sustained visual-vertical experience for him starts to occur in the 900-1,500 range. Above that level, the physical sensation that he referred to becomes a factor. "Once, in practicing the preview technique, I began to read at an extremely high rate—a rate that was later clocked at about eleven thousand words per minute. Going that fast, I lost my sense of self. There was no more 'Here's David practicing the preview technique.' Instead, I became totally immersed in the material. Pages later, I suddenly came to myself and realized that I had been involved in some sort of meditative experience." Typically, when a person becomes so involved in the reading process, the memory intensifies. He can recall much more of what he's read than is possible under ordinary circumstances. Also, as David indicated, there is little or no awareness of the process of reading. Rather, the stu dent begins to experience direcdy the message the author is conveying through the words. Those who reach these higher plateaus of reading usually say they see and understand more of what's on the page than they do when reading at slower speeds. The "structure words" in the book—i.e., the main verbs, nouns and connective words that convey the meaning of the text—seem to leap off the page and into the student's mind and feelings. Perhaps all this sounds too mystical for you, and certainly, it isn't necessary to partake of such a total immersion in a book to get the full benefits of it for academic purposes. But I'm interested now in outlining some of the ultimate possibilities. In some ways, what David Hardwick and others have described may be similar to the whole-brain experience to which others have referred. According to a number of recent studies and theoretical discussions, the right and left sides of the brain have a major impact on how we perceive and experience the world around us. In right-handed people, the left side of the brain is believed to control those mental functions relating to language, logic, mathematics, fact-finding and analysis. The right half of the brain, in contrast, focuses on broader, intuitive, visual, spatial and nonverbal mental functions. How do these ideas relate to reading? A number of observers have said that subvocal-linear reading is all "left-brain." That is, this slower type of reading centers mostly on the logical, word-by-word progression of thought on the written page. Visual-vertical reading, in contrast, is said to pull the more intuitive right brain into the process. When this happens, the brain can not only evaluate and interpret the ma terial logically but can also see the total flow of the text. The mind is no longer limited to the word-by-word order of thoughts on the page; the eyes and mind are freed to move faster, and high-speed reading and study become possible. Whatever the correct explanation for what happens when a student reads at the highest speeds, it's clear that something distinctive does indeed occur. But now the question for you is, "How can I experience this kind of Mental Soaring? How can I reach my maximum possible speed?"